WJSG Internet Radio: Muzik's new headphones will let you share songs online or add them to a playlist with one button. Muzik's new headphones will let you share songs online or add them to a playlist with one button. 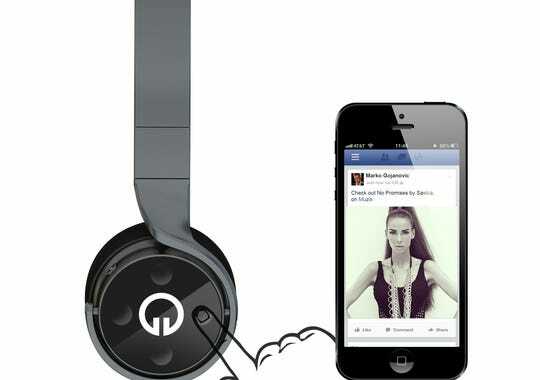 A new start-up, Muzik, has designed a headphone that not only lets you listen to music, but also connects you to your friends on Facebook and Twitter. Built into the new headphones are buttons that let you automatically take the song you are listening to and post it onto social networks or add it to your playlist. They'll be available in the fourth quarter of this year at an expected price of $299. "I started this company with the dream of building a product to help connect people … (and) make the world's smartest headphone," says Jason Hardi, founder and CEO of Miami-based Muzik. In operation just more than nine months, Muzik came out of Hardi's vision to create "Social Smartware," a term the company trademarked for its mission of creating wearable technology that makes it easier for people to stay connected with friends. Hardi, who designed the headphones, founded Muzik along with longtime friend John Cawley. The company's chief strategy officer and vice chairman, Cawley previously served as an executive at Music World Entertainment, which was founded by Mathew Knowles, father of Beyoncé Knowles. "I always looked at the headphone space and wondered, after seeing so much amazing innovation that has happened with the television, the refrigerators, the bracelets and all the connected devices, why people haven't innovated in the headphone space," Hardi says. "What Google is doing with Google Glass, I wanted to do that for the ears." The new Muzik headphones have four buttons on the right earphone that let you save music tracks to your playlist as well as share them on Facebook, Twitter and the start-up's own Muzik software app. To post a song on Facebook, you hold the button closest to your face; for Twitter, the button to the rear. To save to a playlist, you hold the top button, and to save to Muzik's app, the lower one. The headphones send signals to your smartphone via Bluetooth connectivity. The Facebook and Twitter links you post will direct users to song posts on Muzik's platform, which works similarly to Instagram for photos, in that it tracks friends' music, as well as top tracks based on charts and other music sites in the blogosphere. With initial funding of $3.3 million in financing — and another round of Series B funding in the works — Muzik has moved from prototypes to manufacturing its over-the-ear headphones and has begun beta testing of its software platform. The company, which has other products in the works, is showing the technology to music services and social networks. They hope that artists get involved, too, and curate their home space on Muzik's platform. "Part of the goal of the ecosystem is to bring an intimate relationship between fans and the artists so that you really know them," Cawley says. For now, the headphones will work with music-streaming services Spotify and Rdio. And Muzik's software will have an open architecture so that developers can add new apps. Hardi expects developers to make use of on-board accelerometers and plans to add other enhancements. "We can keep making it better," he says. "We can keep making it smarter."